- transfer to Promnice to Noma Residence Hotel 4* and check in. Noma Residence Hotel is the **** category object. Despite a passage of many years the Shooting Lodge maintained its original form shaped in the year 1868. The wooden ceilings, creaking stairs and floors are still in almost original condition. The rooms on the Lodge's I-st and II-nd floor, occupied in the past by the Prince's family and their guests, were adopted to the hotel needs. All the rooms are closed with the massive, wooden doors. Each room is different and it has its own charm. Stylized wardrobes, beds, bureaus, toilets or armchairs excellently fit the antique Lodging interiors. Through each room`s window there is a view of beautiful Promnice's gardens and the Paprocany lake. Behind the windows there are birds singing and in the evenings the frogs and crickets give their "concertos". OPTIONAL TRIP: Visiting Tyskie Brewery with beer tasting. The documented history of the fortified Pszczyna castle goes back to the first half of the 15th century, when in 1433 the castle and the town managed to hold out against a Hussite invasion. It is worth mentioning that the major part of the castle’s historical furnishings (about 80%) from the late 19th and early 20th centuries has been preserved. During the last decade numerous preservation works were carried out. On the basis of the iconography and the castle inventories preserved in the archives, the rooms of Pszczyna castle have been given back their old colour schemes, gilding and furnishings. At present few castles in Europe can boast of being in such good condition. 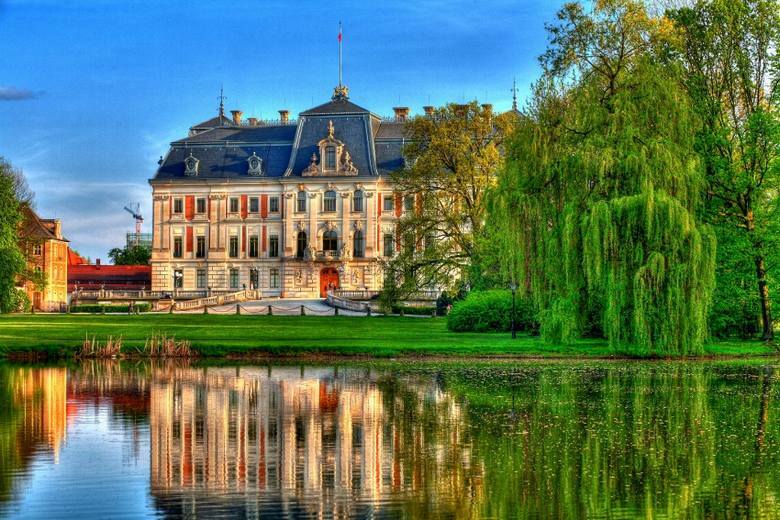 Moszna Castle is one from most well-known antique objects on opolska the ground. Something has in itself amazing, it surprise magnitude and imagination. It is object, to classify which hard unambiguously, because it is architectural relic, though it has only 100 years. The Książ Castle, one of the largest in size in Poland, is a magnificent sight. It is situated in an extensive park on the edge of a cliff. It was known as "Clavis ad Silesiam" - "The Key to Silesia" - because it protected the road conducting into the Silesia region. Many architectonic style can be observed in this castle, because it was rebuilt many times as the centuries were passing. The most magnificent interior of the castle is the Maximilian Hall from 18th century.